An Evening of Informal Dancing, Singing, and Fun!! 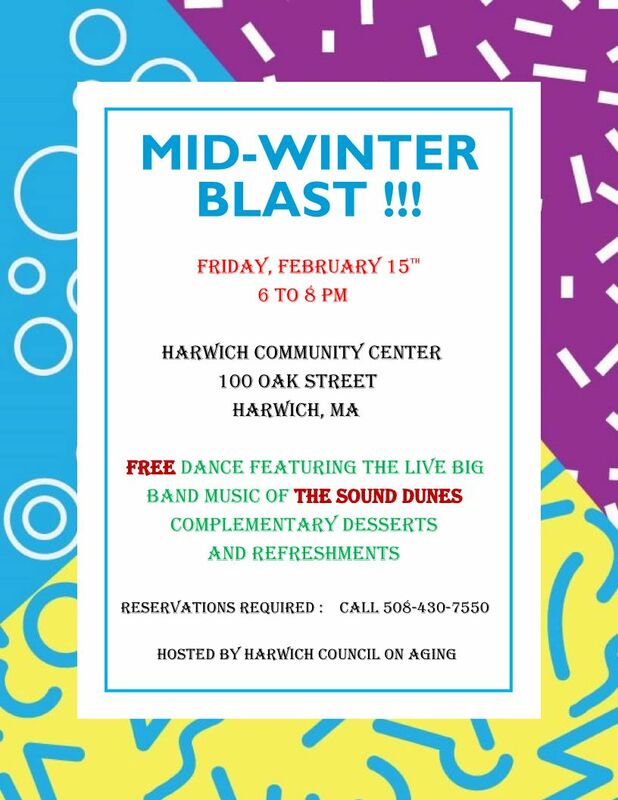 On Friday, February 15th, The Sound Dunes Swing Ensemble (SDSE) performed at the Mid-Winter Blast Dance sponsored by Harwich Council on Aging (HCoA). The dance was held in the auditorium/assemblyroom of the Harwich Community Center. Those who attended the FREE public event were treated to an assortment of Swing, Latin, Ballroom, and Jazz dance music, along with an occasional more recent selection. An additional treat for the many dancers and toe-tappers who were in attendence was the public debut of our new female singer, Carole Madru, who also plays rhythm guitar for us. Carole joined our two longtime songsters, Tom Jahnke and Linda Delorey, for the crowd’s enjoyment. We are fortunate to have a video snipet, provided by Carole’s husband James, of Carole singing “La Vie en Rose” (originally made famous by Edith Piaf) during that Friday evening performance. The video was taken from behind the band’s setup on the stage of the Harwich Community Center where James is usually positioned while he plays his Bass Guitar for us. You can barely see Carole in the video on the far side of the band about midway back at the microphone. We apologize that the audio may be a little muffled because of the location of the video camera/mic…. A FREE Evening of Informal Dancing, Singing, and Fun!! On Sunday, October 14th, The Sound Dunes Swing Ensemble (SDSE) performed during a fundraiser sponsored by The Alzheimer’s Family Support Center (AFSC) of Cape Cod. 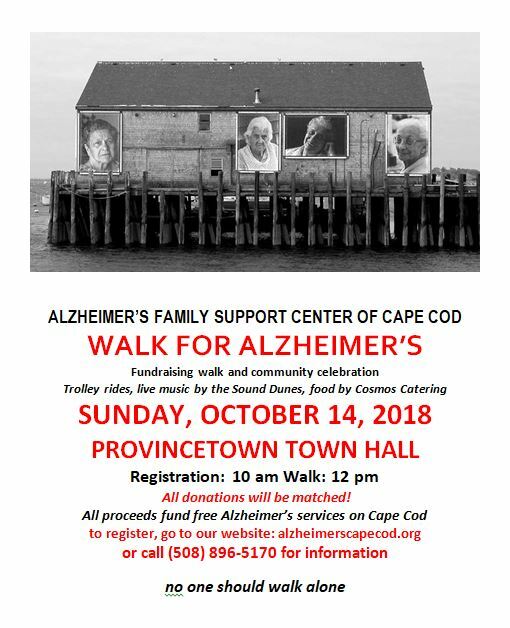 The band performed in the 2nd floor auditorium of the Provincetown landmark Town Hall building which also served as the focal point for the event fundraiser and Walk. The fundraiser was considered a great success by the AFSC sponsoring group which acknowledged surpassing their fundraising goal of $100,000 which was matched by a generous donor. After the walk, the participants had a party with food, live music by SDSE, and dancing. The AFSC thanked everyone for their generosity! Here are a few photos that were taken during the SDSE performance from the October 14th event…. In keeping with the sentiments of the season, a number of the members of the Sound Dunes Swing Ensemble (SDSE) helped organize and participate in the Living Creche event in Dennis Village during mid-December. The evening started with a choral concert by the Dennis Union Church Choir, followed by a candlelight procession along Route 6A to the Dennis Village Green and gazebo. Upon reaching the Green, the New Testament story of the Nativity was read and enacted by local adults and children, live cattle, goats, a very personable donkey, and an infant who portrayed the baby Jesus. Here are several photos from the event. Perhaps next December you may want to attend the event as a way to start off your holiday season. Again, Happy New Year to all of you! P.S. 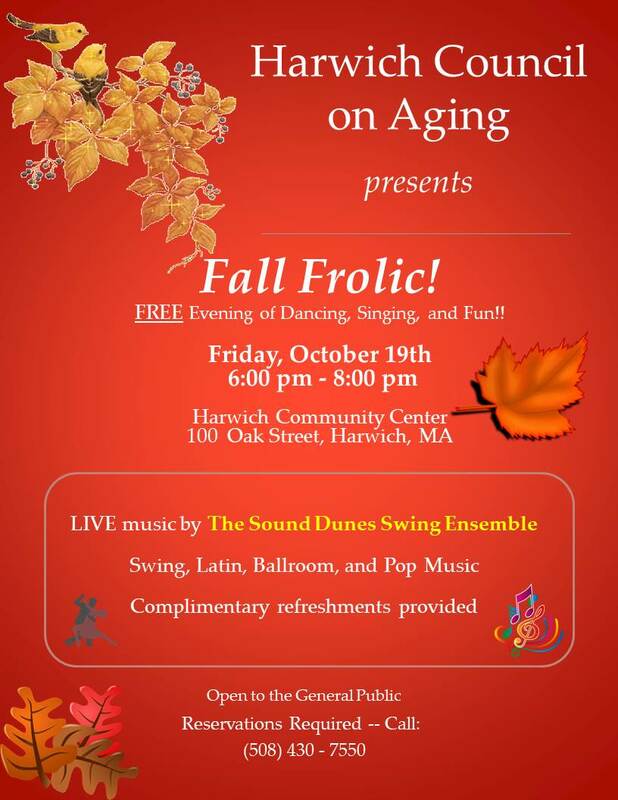 : Just a note about our next SDSE event….an informal Dance at the Harwich Community Center hosted by the Harwich Council on Aging. The dance event is FREE and will be held on Friday, February 15th, from 6 to 8 PM with LIVE music provided by The Sound Dunes Swing Ensemble for your dancing and listening pleasure. RESERVATIONS WILL BE REQUIRED…… call 508 – 430 – 7550. The 2nd Annual Harwich Cultural Center “Christmas in Harwich” Open House will take place on December 1st with presentations of kids crafts, live music, and open artists’ studios. The Sound Dunes Swing Ensemble will be providing live Big Band holiday music from 2:30 to 4:00 PM. Come listen, sing, and dance to your favorite holiday tunes. There will be a Christmas sing along and reading of “Twas The Night Before Christmas”. Hope to see you there! The Sound Dunes Swing Ensemble will be providing live Big Band holiday music from 2:30 to 4:00 PM. Come listen, sing, and dance to your favorite holiday tunes. There will be a Christmas sing along and reading of “Twas The Night Before Christmas” . Hope to see you there! Want a great way to start the 2018 Holiday Season? SDSE recommends a performance of The Sea Captain’s Nutcracker…..It’s Tchaikovsky’s Nutcracker with a Cape Cod twist! This production is an innovative version of the classic holiday favorite. Set in a Chatham Sea Captain’s home in the mid-1800’s, the script takes us on an enchanting journey through local history and folklore invoking elements of the natural environs of Cape Cod. The cast of over 100 dancers will include professional dancers from major U.S. ballet companies as well as prominent local citizens and students from Cape Cod! A FREE Evening of Dancing, Singing, and Fun!! 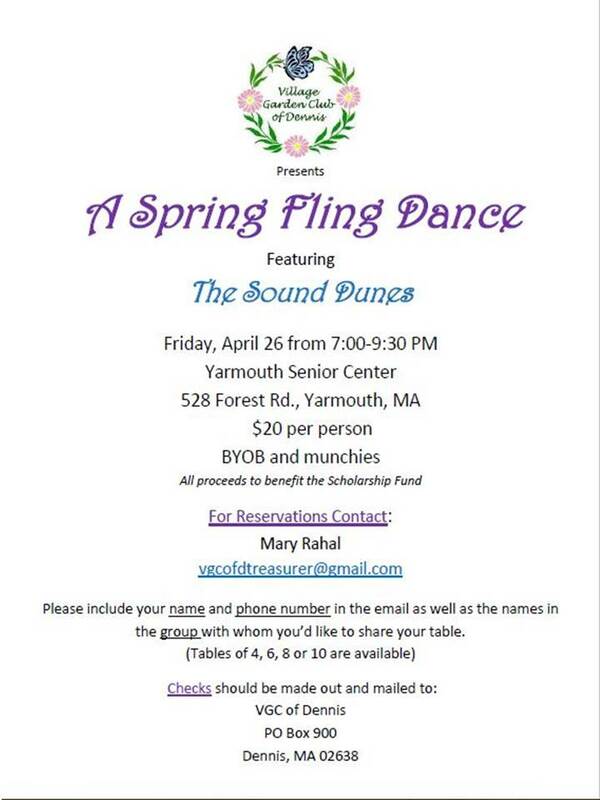 A Spring Fling Dance April 26, 2019 at 7:00 pm – 9:30 pm Yarmouth Senior Center, 528 Forest Rd, West Yarmouth, MA 02673, USA FUNDRAISER - Dance sponsored by the Village Garden Club of Dennis. Tickets Price $20. Featuring the "Sound Dunes Swing Ensemble." Contact Mary Rahal for more information and reservations at vgcofdtreasurer@gmail.com. BYOB and munchies.